Small wrist top GPS device with easy to read color display, intuitive user interface with simple button operations, integrated G-sensor to record data during outdoor and indoor trainings, premium heart rate monitor, data exchange via BlueTooth, WLAN or USB cradle, supports Garmin Connect and LiveTracking. Suitable for all kinds of sports activities, especially running. 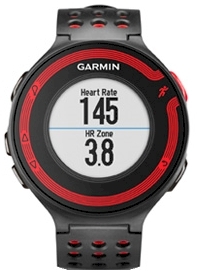 As a personal training assistant, the GARMIN Forerunner 220 records the travelled path (track), your heart rate (requires heart rate monitor which is included in the pack but is also available as an option), distance, time and pace/speed, computes the calories burned and helps to achieve your personal workout goals. The device is very easy to use, supports multiple languages and has an extremely sensitive antenna. It is the perfect partner for any outdoor activities. Supports data exchange via BlueTooth, WLAN or USB cradle. The optional mounting kit for handlebar makes the Forerunner 220 also well suited as a bike computer. The Forerunner 220 is especially well suited to provide information about your outdoor activities (track, speed, distance, moving patterns, heart rate, time a.s.o.). It cannot display coordinates of the current location. If you have an iPhone or an Android smartphone, you may connect it with your Forerunner 220 using Bluetooth. Use this feature to share your position and workout data with your friends in real-time (live tracking). The free App Garmin Connect Mobile must be installed on your smartphone in order to use this functionality. Integrated 12 channel GPS receiver with very sensitive built-in antenna. Premium chest belt with heart rate monitor. (included with the "Pack", but also available as an option). The chest belt uses a digitally coded signal, which means, once a heart beat sensor and the GPS have been paired, the GPS will never receive a conflicting signal from another sensor. So you can exercise in close proximity to other sensors without fear of interference. Wireless data exchange via BlueTooth and WLAN. Supports LiveTracking when connected with a supported smartphone. Data exchange with a PC with included USB data/charging cradle. Profile: Stores personal information such as gender, date of birth, weight and height in order to calculate the heart rate zones and the calories burned. Various settings, such as values to be displayed on the pages, heart rate zones, limits etc. 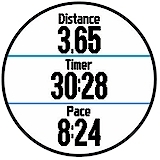 Stop watch with split times (laps). Records split times either manually by pressing the "lap" key or automatically based on a user defined distance (auto lap). Alerts for various limits such as heart rate, pace and walk/run interval. Auto scroll: There are multiple pages with different values available. If you enable auto scroll, then the watch automatically cycles through these pages, either slow, medium or fast. History: The Forerunner keeps track of your workouts. It stores the date, time, number of laps, duration, distance, average speed, calories burned, average and maximum heart rate (requires a heart rate monitor which is included in the pack but is also available as an option). These values are stored on a daily basis. 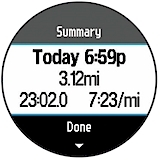 The Forerunner also provides weekly and monthly overviews and running totals for duration and distance. Personal records: The Forerunner keeps track of your personal records such as the shortest time for one kilometer rsp. one mile, 5 km, 10 km plus longest distance travelled during one activity. Stores up to 200 hours of training data. Note: You may configure the display through options. The screenshots below are just examples, the actual appearance may vary from the displays shown below depending on the current settings. Especially the content of the data fields is user configurable. You can choose from 15 different values, see the table below. Select the value for each data field, see table below. For each data field, you can choose one from the following 15 values. Speed is meassured in distance per time, usually kilometers per hour (km/h). Pace is meassured in time per distance, usually minutes and seconds per kilometer (/km). Data exchange: Supports archiving of data collected with Forerunner 220 devices. 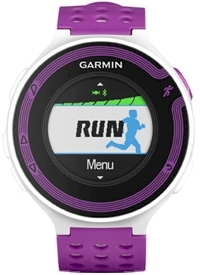 These models have been discontinued; however, you can still order options for the GARMIN Forerunner 220. All options for the GARMIN Forerunner 220 in detail. Here we provide additional documentation and software updates related to the Forerunner 220.